Summary: How MacImage can help you to build a .DS_Store file to define precisely the aspect of the root folder appearing when the volume is opened on the target MacIntosh computer. To store some information about the layout of the windows, the size and spacing of the file icons, etc., the Finder puts data into a hidden file named .DS_Store in almost all visited folders. This is a known problem and you should just make a search on the internet to get more information. On the other hand, this feature lets the user define precisely the layout of the root window of a CD-ROM, for instance, which makes it a desirable feature. Therefore, many users asked us to study the .DS_Store scheme to allow the same degree of freedom when building a CD-ROM on a PC with MacImage. It was a lot of hard work because, as usual, nothing is correctly documented and one has to use the trial and error method to ascertain even the smallest facts. Roughly speaking, the user interface is divided in four quarters. In the upper left quarter, MacImage displays a list of files included in the root of the (future) CD-ROM, with the coordinates of each icon center. Below, we display the size of icons (16 to 128 pixels), the character size used for the filenames (10 to 16 points) and least the icon spacing (0 to 100 pixels). 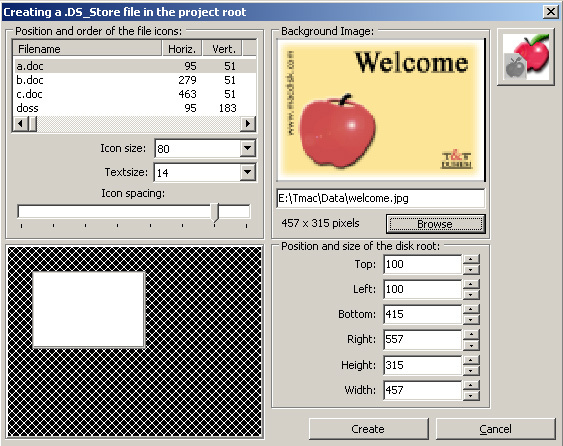 In the upper right quarter, the program displays a window to select and show a graphical file (JPEG) to be used as window background. The file contents is displayed at scale 1/4. The program also gives the precise size of the graphics. If the window displayed below is not big enough to contain this file, it is automatically corrected. We arrive now at the bottom part of the dialog box. Left, the program displays a scaled-down version (1/4) of the window on a 1024 x 768 pixel screen. On the right, the numerical values are given. If you change something to those values, the graphical preview is updated accordingly. Last but not the least, two buttons allow you to cancel everyting or to create the .DS_Store file. The background file was replaced by an editing box, where you can change the x and y values (horizontal and vertical position). The 'Save' button saves the changes and allows you to double click on another item. The 'Hide Pane' button closes this pane and returns to the former interface. This working mode is useful if you want to add a good delta to a position to be sure that the item will be outside of the window. If you choose to create the file, MacImage first puts a .DS_Store file in the project root and asks where to store it on the hard disk, to be able to retrieve it when compiling the image. If you selected a graphical file as background (the background is white by default), MacImage includes in the project file an hidden filder named '.background' and, within this folder, the selected graphic file. Those items will thereafter be included in the compiled image file. The link to the graphical file is hard coded in the .DS_Store file. Therefore, you should change nothing important afterwards. In particular, don't include new files in the root folder, don't change the volume label, etc. 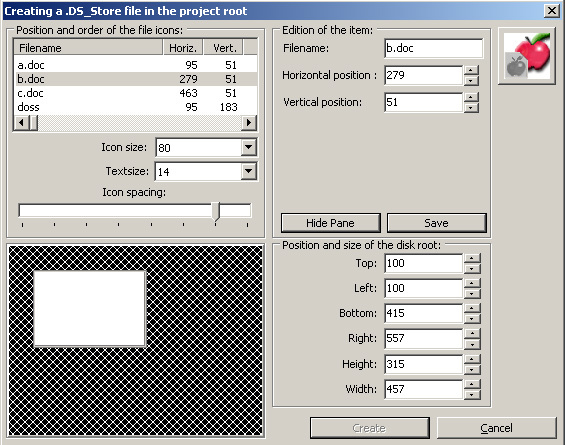 Nevertheless, you may redo everything after deleting the .DS_Store file and the '.background' folder and its contents. On the other hand, if you call the same feature again, the program will reload the .DS_Store file and its contents. A very practical way to make a last minute change without redoing everything from the beginning.